After months of rumours and leaked images, Olympus finally announced the OM-D officially at the National Geographic Store, VivoCity Singapore on 8 Feb 2012, 11am. OM-D is the branding of the digital line of Olympus OM, which had a history since 1972, just like how Olympus names the PEN for the other earlier mirrorless camera series. Olympus is targeting the OM-D to “serious photographers with creative attitude” and “admirers of product quality and sophistication”. The model name for the launch is E-M5. World’s first dust & splash-proof capability mirrorless camera. Proven with the E-5 camera. World’s first*¹ 5-axis image stabilization to compensate for camera shake of any kind during both still photo and movie shooting. World’s fastest*² FAST AF autofocusing system plus 3D tracking for improved moving object tracking performance. Built-in electronic viewfinder with high image quality and high functionality that enables real-time checking of various shooting conditions. 16-megapixel new Live MOS Sensor and TruePic VI image processing engine for high image quality and high sensitivity. Classic Physical Build. It looks and feels like the classic SLR, down to the black coating and the weight (the silver colour is plastic and not the actual aluminium body). 9.2 frames per second. One of the fastest fps for a mirrorless camera, the shutter mechanism is much lighter and softer than the PEN series. When AF-tracking is enabled, the E-M5 can still fire at 4.2fps. Fast AF. It’s in theory faster than E-P3, but I think the difference is very small, albeit critical enough to help you capture the moment. Under low light conditions, there is still the usual hunting (pre-production unit), so the speed will vary depending on the shooting conditions. 3-inch swivel touchscreen OLED monitor. Allowing you to handle shots of difficult angles, plus ease of selecting AF points by touching the screen. Electronic viewfinder of 1.44M pixels. It’s sharp and responsive with minimal lag even at low light. It’s rather usable for non-demanding use. 5-axis image stabilization. I didn’t manage to try this feature, but once people starts to get review units, you will see whether it does make a difference in improving stabilization. Splash-proof. It was demonstrated during the launch: running water poured onto the E-M5 with lens. No sweat. Live Bulb. Imagine when doing bulb shooting, the monitor refreshes the result of the exposure. This redefines the way you capture long exposure images, for now you can see the result and decide when to close the shutter. Fireworks photos will be perfect every time. Echo movie effects. This effect lets you freeze a frame and fade off while the movie continues. One-shot echo lets you decide when to apply this effect in a movie recording, and Multi-echo does this constantly throughout the recording. Power Battery Holder. This holder is unique as there are 2 parts. One part is the horizontal handgrip and the other is the vertical handgrip. 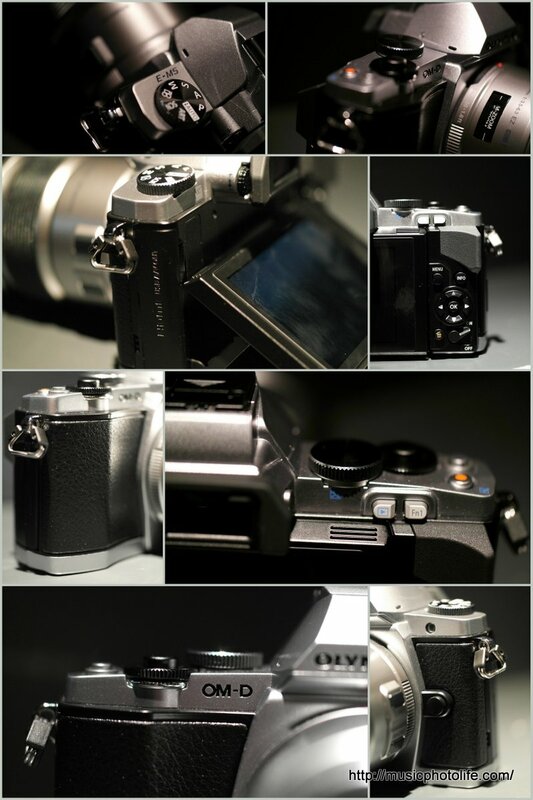 You can choose to use just the horizontal handgrip to improve the handling of the E-M5. Even after attaching the grip, the OM-D E-M5 feels small and yet looks like a true-blue SLR! The new splashproof 12-50mm f3.5-6.3 kit lens has some useful features. Firstly, the push-pull zoom ring allows you to focus mechanically as well as electronically. Secondly, there is a programmable “Fn” button on the lens itself. The lens size is rather big but you get greater zoom range than the usual. The E-M5 does not have built-in flash, but has a smart accessory port which allows you to slot-in a small flash which is powered by the camera itself, just like the E-PM1. The Olympus OM-D E-M5 will be available after March 2012. If you love the classic SLR look and not too concerned about the weight (compared to the other mirrorless models), then do keep a lookout. Good thing about getting this model is that there are already a lot of micro four-thirds lenses that can be used with this new camera.